A month ago one of my best friends from college got married. And while I could go on and on with friendship, love and sappiness talk, I'll spare you and get right to the good stuff. 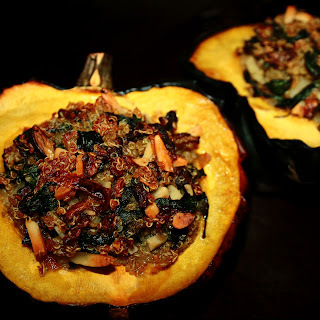 At her rehearsal dinner, the catering company made these fabulous stuffed acorn squash. I've had acorn squash stuffed before. Heck, I make a wild rice and sausage stuffed one that's pretty tasty. BUT, this squash was stuffed with quinoa and it was amazing. I've tried quinoa once before and it was a HUGE flop. It ended up a mushy ball and I avoided it until recently. If you've had a similar experience, give it another try. I'm glad I did! Not familiar with quinoa? It's a grain... think of it as an alternate to rice, couscous or bulgar if you've had that. It's not scary and it's pretty easy to find in almost every grocery store. Plus it's packed with protein and magnesium. I'm not exactly sure what was in the stuffed squash at my friends rehearsal dinner but the version I've come up with is really tasty. 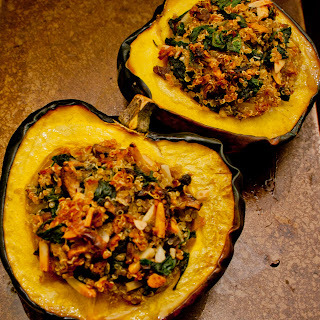 The squash is creamy and sweet and the quinoa stuffing is crunchy, earthy, and hearty. This is a hearty dish on it's own but it would be a killer side with any meal too. It would make a great side for Thanksgiving if you're looking to do something a little different. It's a really fun presentation too. Each person gets their own individual squash bowl. 2 weeks until turkey day... are you ready? Preheat oven to 350º F. Follow the directions on the box of quinoa and cook accordingly. You can use chicken, beef or veggie stock instead of water to add extra flavor if you like. In a medium saute pan, add olive oil (enough to thinly coat the bottom of the pan). Once the pan is hot, add in your chopped leeks and mushrooms. Cook until wilted and slightly browned. Add in your garlic and spinach. Meanwhile, in a small pan, toast your slivered almonds over medium heat. Once spinach is wilted, add in your almonds, truffle oil, and salt + pepper to taste. 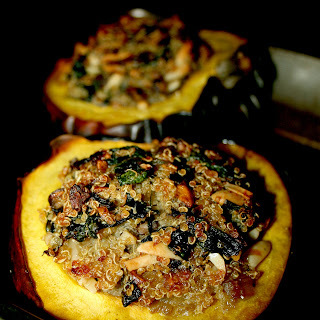 Once quinoa is cooked, toss your mixture with the grains and you're ready to place in your squash. Place stuffing into the center of each squash and drizzle with a little extra olive oil over the top. Bake in the oven for about 30 - 40 minutes until squash is softened and the top of the stuffing is golden brown. this is the kind of recipe where you look in your fridge and you see what you have. leek can be substituted for onions, shallots, green onions. not a fan of mushrooms? leave it out and add in your favorite veggie instead. i like the crunch that the almonds give to the dish but you could leave them out or add in your favorite nut. spinach could be substituted for kale or chard or your favorite leafy green or herb. the addition of cheese would be more than welcome. a creamy goat or feta would be fantastic but you could use any type you like. now the truffle oil... here's the thing about truffle oil - it's STRONG. a little goes a long way. you can use white or black truffle oil. if you don't have any on hand, you can leave it out or you could use another flavored oil. i feel like the truffle oil adds depth to the mushrooms already in the dish but it can easily be left out and still taste great. another substitution that goes in a completely different direction would be a squeeze of lemon. it would add a brightness to the stuffing. you could do this in a butternut squash or any kind of squash or pumpkin for that matter. the only one i wouldn't recommend is spaghetti because the texture would just be, well, weird. the final substitution i'll offer is by putting your favorite thanksgiving stuffing in the squash. it's a fun presentation and everyone gets their own individual portion of stuffing. think cornbread, sausage, oyster, wild rice... whatever your family's favorite is. this would go perfect with your thanksgiving turkey!